I'm slowly working through the design for the new bilge pumping system on Ravat. There's a lot I would like to do, but with time and budget being constraints I need to focus on what's important. Since the boat should be relatively dry these days given the new windows, hatch, hull-deck joint, and freshly rebedded deck hardware, I am thinking that my de-watering needs are significantly reduced. Yes, the stuffing box will continue to drip, but I'm hoping that once it has been repacked with Gore stuffing it will be of little consequence. As it stands today the plan is to have two pumps on board. One is the original Henderson MK-IV manual pump. I've removed the Y valve, and will replace all of its hose with Trident XHD bilge hose. This pump will continue to use its original through-hull. Instead of pumping both bilges, I will leave a single hose in the engine sump and possibly add a weighted strum box. This pump will only be used in emergencies. The second pump will be a (moderately) high capacity pump that is essentially the biggest pump I can fit into the shallow and narrow bilge of my CS27. That happens to be the forward keel bilge, which extends the hose by a few feet. It's also not technically the lowest point in the bilge, but it's within an inch or less. Since I'll need 2-3 inches of water to make this pump kick off, that's not an issue anyway. 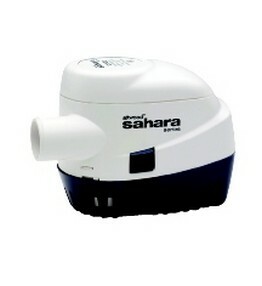 I'm 99% certain that the pump will be an Attwood Sahara 1100. I can't fit any of the 1500+ GPH pumps into my bilge, unfortunately, so 1100 GPH is about as big as I can go. De-watering will continue for the short term to be manual pumping and sponge work. I never really found it oppressive when the boat was leaking all over, so I'm sure it won't be bad now that the boat is pretty dry. This pump will be connected to the house bank positive bus, so will be available even when the boat's switch is off. I'm planning to use a Blue Sea bilge pump switch as I've been very impressed with everything else they make. I also like that it's more narrow than the popular Rule switch which is also a great choice. I'm still hashing out the best place to mount the switch. My companionway surface is just about full now that I've mounted the Victron battery monitor and the new fuel gauge. I have a few places in mind, but I anticipate needing some head-scratching time before I'm ready to make any new cuts.